Modern day Afghanistan is one that westerners know as rife with terror, sublimated and subjugated women, and often barbaric retributions. What I had to keep reminding myself while reading this story was the juxtaposition between those who are raised in the culture and have a sense of the expectations with my own, and one of the MC’s outlook that is decidedly more western in approach. Having read and LOVED The Pearl that Broke it’s Shell, Nadia Hashimi presents her stories without shutters or blinders, each moment feeling as if you are present to witness the moments. In this story, we have Zeba in the midst of a crisis. Her husband of twenty years is found dead, the murder weapon nearby. Unable to process the moment and the shock to her system, she’s unable to provide her own alibi, even to the few willing to hear it. Her husband’s family is convinced she murdered him, and the quick rush to judgment of her guilt in a society that is quick to judge and punish women for any number of, to our eyes, minor offenses, is horrific. Enter Yusuf, an Afghani lawyer raised and educated in the US. His own determination to bring his homeland to a more modern outlook, particularly in regards to human rights for all, particularly women. He’s thinking that while not easy, defending Zeba will be reasonably easy once he explains himself and shows her another way. What emerges is a quiet revolution: Zeba is adopted into an unlikely sisterhood where the women, free from societal censure and retributions of the moment, are sharing stories, dreams and hopes. The stories are hard to read, and while outcomes are tragic, the apparent acquiescence of these women, accepting their lot in life is far less than expected. Zeba is far more than a simple country housewife, she’s a force with an inner core of strength that allows her to survive and persevere in some unthinkable conditions. Lyrical prose and compelling stories take the edge off a difficult read, one that required many breaks for some of the conditions and life stories are harsh, bordering on barbaric. But, even in the breaks, I couldn’t walk away or stop thinking about the moments, the integral connections to the tribal laws and fundamentalist beliefs that feel foreign, if not completely unknowable. A wonderful book, well worth your time and effort. A vivid, unforgettable story of an unlikely sisterhood—an emotionally powerful and haunting story of friendship that illuminates the plight of women in a traditional culture, from the author of the bestselling The Pearl That Broke Its Shell and When the Moon Is Low. For two decades, Zeba was a loving wife, a patient mother, and a peaceful villager. But her quiet life is shattered when her husband, Kamal, is found brutally murdered with a hatchet in the courtyard of their home. Nearly catatonic with shock, Zeba is unable to account for her whereabouts at the time of his death. Her children swear their mother could not have committed such a heinous act. Kamal’s family is sure she did, and demands justice. Barely escaping a vengeful mob, Zeba is arrested and jailed. Awaiting trial, she meets a group of women whose own misfortunes have led them to these bleak cells: eighteen-year-old Nafisa, imprisoned to protect her from an “honor killing”; twenty-five-year-old Latifa, a teen runaway who stays because it is safe shelter; twenty-year-old Mezghan, pregnant and unmarried, waiting for a court order to force her lover’s hand. Is Zeba a cold-blooded killer, these young women wonder, or has she been imprisoned, like them, for breaking some social rule? For these women, the prison is both a haven and a punishment; removed from the harsh and unforgiving world outside, they form a lively and indelible sisterhood. 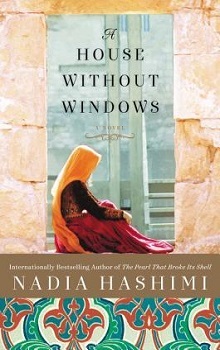 A moving look at the lives of modern Afghan women, The House with No Windows is astonishing, frightening, and triumphant. With her rigorous medical training completed, Nadia turned to a passion that had been ignored for too long. Her upbringing, experiences and passions came together in the form of stories based in the country of her parents and grandparents (some even make guest appearances in her tales!). Her debut novel, The Pearl That Broke Its Shell will be on sale May 6, 2014. She’s putting the finishing touches on her second novel about the often tragic plight of Afghan refugees across Europe. She and her husband are the beaming parents of two curious, rock star children and an African Grey parrot.